from 3 pcs. 11,66 EUR ea. from 10 pcs. 10,77 EUR ea. from 20 pcs. 10,38 EUR ea. from 40 pcs. 9,99 EUR ea. Blank name tags for quick, individual and professional printing of business-card-size cards, compatible with the name tags Name tag Business and Name tag Freestyle. 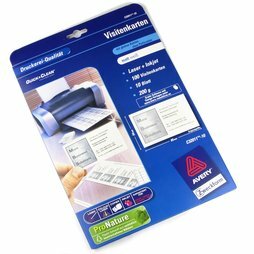 Suitable for laser and inkjet printers, enough for 100 business cards. Thanks to the practical template and high-quality paper, you can print individual business-card-size cards (54 x 85 mm) in no time. The individual cards can be easily separated and have even edges. Here you can see the combination of a color-printed business card and our name tag holder.